Deck mount shown. Purity light (conductivity light) shown For illustration purposes only. Order lights seperately. Optional conductivity light base with standard 1/2" SPT connector makes it easy to tell when water purity has dropped below prescribed level. Can be substituted for standard base on units available with our Series VB vacuum breaker installed. This prevents back siphonage of contaminated solution into the line. Conductivity light base w/standard 1/2" S.P.T. 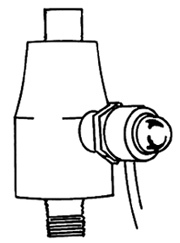 connector may be substituted for standard base on any FC assembly. Use this light with our optional light base to monitor the quality of your water. The body of the light is of all PVC construction for compatibility with high purity water systems. The indicating lamp glows when the water purity is above a specific value and ceases to glow when water purity is below specification.